Asia Times, January 24, 2003. Illicit opium production occurs predominantly in Asia, although opium and heroin are also being increasingly produced in Colombia and Mexico. While post-Taliban Afghanistan has regained its position as the first producer of illicit opium in the world (see The ironies of Afghan opium production, September 17, 2003, Asia Times), the United Nations Office on Drugs and Crime (UNODC) has monitored a decline of production in Myanmar in 2003. For decades, Myanmar, known as Burma before the military junta in power in Yangon renamed the country in 1989, has ranked either first or second in global opium production. Although opium production in Myanmar has long been estimated by both the UN and the US Department of State, their respective annual figures have never been concordant and debates on whether the production was increasing or decreasing have been controversial. However, in 2003, the UNODC was able to conduct a ground survey in some areas of the Shan State of Myanmar and therefore to extrapolate the interpretation of satellite images to the rest of the Shan State. The Myanmar Opium Survey 2003 of the UNODC estimates that 92 percent of opium production in Myanmar occurs in the Shan State, a mountainous and rather isolated area covering 155,000 square kilometers along the borders of China, Laos and Thailand. Going by that estimate, 810 tonnes of opium would have been harvested from 62,000 hectares of opium poppy cultivated in Myanmar, down from 828 tonnes and 81,000 hectares in 2002. However, although the US Department of State also reported a decline in Myanmar’s opium production in 2003 (quoting even lower figures), some critics contend that such a decrease only happened in the Shan State and much less in Myanmar as a whole. Indeed, a recent report emanating from an independent media group asserted that the decrease in the north of the Shan State had been more than made up by a marked escalation in the south and east of the area, thereby contesting the validity of the UN report. Is the UWSA committed to opium suppression? Concurrent with the controversy over the estimate, or even the increase or decrease, of last year’s opium production in Myanmar is the broader geopolitical problem of the country itself. Partial discourses and representations that are characteristic of any geopolitical problem drive the current arguing on the drug issue in Myanmar. Indeed, drug production has played and still plays a fundamental role in the protracted conflict of Myanmar: opium has long been at stake in its armed conflicts and also became the sinews of these conflicts that its trade allowed and developed. During the decades of armed conflict in Myanmar, all groups have benefited at least to some extent from the illicit drug trade, whether by reaping direct financial benefits from it, by taxing it like any other traded commodity, or by condoning it in order to affect the fragile balance of power that exists among various groups. The military junta holding power in Yangon also participated in playing the opium card to achieve some of its short-term geostrategic objectives, notably by signing ceasefires with former armed opponents but also as a method of subsidizing its army expenditures at the field level, as well as providing personal financial incentives. The highly controversial debate about opium production in Myanmar has a lot to do with evaluation of the scope of responsibility of the United Wa State Army (UWSA) in the drug trade, but also with the implementation by the UN of its Wa Alternative Development Project (WADP) in Wa Special Region No 2 (WSR2) of Shan State. While the UNODC gives credit to the commitment of the UWSA leadership to suppress opium production completely by 2005, and while it tries to soften the brutal impact that such a suppression would have on the Wa people themselves, critics of the military junta and local ethnic-based groups opposed to both the junta and the UWSA believe that neither Yangon nor the UWSA are sincere in their opium-suppression agenda. They also argue that the UNODC is being abused and that its very presence legitimates both Yangon’s ruthless dictatorship and its ally the UWSA, sensationally dubbed « the world’s biggest drug trafficking army » by the US Department of State. The WSR2, the territory administered by the UWSP and controlled by the UWSA in the Shan State, was estimated by the UNODC to have produced 34 percent of all Myanmar’s opium in 2003, up 21 percent since 2002. Also according to the UNODC, the largest decrease of opium production last year took place in the northern Shan State (Kokang), while significant decreases also occurred in the southwestern and southeastern areas of the Shan State. UNODC officials explain this production upsurge in the WSR2 by a drastic 50 percent drop that occurred in the Kokang area and caused a north-south drift of opium farmers and production into the northern WSR2 area. Kokang authorities had issued an opium ban in 1997 to make the Kokang Special Region No 1 an opium-free zone by 2001. The most virulent critics of the UWSA achievement in suppressing opium production and of the projects implemented by the UNODC in the Shan State emanate from the Shan Herald Agency for News (SHAN), an « independent media group » that recently published a « Show Business » report on Yangon’s « war on drugs » in the Shan State. SHAN is a media group related to the Restoration Council of Shan State, the political setup of the Shan State Army (SSA) – one of the last armed groups still fighting Yangon’s military junta. Thus, while clearly contributing to a better understanding of the situation in the Shan State through its valuable field surveys and reports, SHAN views are also necessarily tainted by the Shan’s political objectives that are at stake in the protracted Myanmar crisis. While the UWSA authorities state their unconditional commitment to opium suppression, SHAN argues that they lack sincerity in implementing such an agenda, mentioning for example that one of the brothers of UWSA commander Bao You-xiang was involved in opium production and had caused the temporary closing of one of UNODC’s field offices in the WADP area. Also, SHAN regrets that there has been no debate about the means by which the UNODC obtained its figures, something very much understandable as the survey was carried out in conjunction with Yangon’s Central Committee for Drug Abuse Control and thus not in the most independent way. Thus SHAN, but also many Myanmar watchers, raises serious questions about both the sincerity of the UWSA leadership and the validity of the UN survey. However, what is currently at stake in Wa Special Region No 2 is not only the sincerity of the UWSA or the validity of the UN survey but the fate of the Wa people. Wa peasants are the ones who will indisputably suffer from the implementation of an opium-suppression agenda that is already under way and going fast – perhaps too fast. Considering the fact that only genuine peace and sustainable political development can resolve the Myanmar crisis, it is obvious that neither international aid nor economic sanctions will succeed in solving either the drug problem or the overall military crisis of the country. However, while economic sanctions have never proved successful to achieve regime changes (except maybe in South Africa), international aid should not be denied to people already suffering from political oppression and economic underdevelopment, and who will thus be in even more dire need of humanitarian aid if opium suppression were to be fully implemented. To understand better the role played by the UWSA in the current geopolitics of illicit drugs in Myanmar, one has to resort to both geohistory and geopolitics. Geopolitical analysis requires untangling a situation in which different actors deal with one another through representations that are mostly partial, biased and contradictory, as previous observations on the Wa and the Shan have exemplified. Thus, to understand the UWSA better, against which heavy prejudices exist, one has to resort to both geohistory and geopolitics of the Wa ethnic group itself. The Wa are one of the least-known peoples of Asia, although 400,000 of them are said to inhabit the Shan State of Myanmar, and 600,000 the Yunnan province of China. Indeed, very little has been written on the Wa, except in Chinese, between Sir J George Scott’s 1900-01 Gazetteer of Upper Burma and the Shan States and Magnus Fiskesjo’s 2000 unpublished PhD dissertation, « The Fate of Sacrifice and the Making of Wa History ». In fact, most of what has been written on the Wa has to do with the UWSA. The 20,000-strong UWSA is the military wing of the United Wa State Party (UWSP) and was formed after the collapse of the Communist Party of Burma in 1989. The Wa altogether, and not only the UWSA, have been said to challenge regional stability in Southeast Asia, something that Thailand, the main consuming market of methamphetamine pills (ya ba) produced among other areas in UWSA-held territory, has long been keen to advocate. Indeed, Thailand has repeatedly denounced the UWSA as being the main threat to its national security. Although one cannot deny the fact that some elements of the UWSA are involved in illicit drug production and trafficking (opium, heroin and methamphetamines), one also has to acknowledge the bias that the outside world holds against the Wa ethnic group who, as a people, are of course no more natural-born traffickers than any other. Myanmar’s tribal peripheries have always been difficult to access, by the Burmans, the Chinese, and even to the British and the Japanese. Of course, the protracted Myanmar conflict has only made isolation worse by making physical accessibility even harder through political unrest. This explains to some extent the current lack of reliable information on the Wa, one remote hill tribe among others. Hence, still reflected in today’s literature on the Wa of the UWSA is the tendency to observe them from the outside. Thus, when it comes to describing the Wa and their current responsibilities in the drug trade, one may wonder to which extent representations, both cultural or political, take over factual evidence. Indeed, as mentioned by anthropologist Magnus Fiskesjo, the Wa have always been looked at from the outside, their territory being referred to as a periphery, although when « looking out from the Wa center, we encounter first the galaxy of Shan Buddhist principalities found along the China-Burma frontier, and second, the Chinese and Burmese states, located at a still farther distance ». It quickly appears, then, that not much has changed in terms of geopolitics when one looks at the power struggles still going on among Myanmar, Chinese, Shan, and even Thai political and military outfits. Indeed, the Wa, the former cannon fodder of the Chinese-backed Communist Party of Burma, formed the UWSA and allied themselves to Yangon in 1989 (after signing a ceasefire with then Lieutenant-General and now Prime Minister Khin Nyunt), then militarily contributed to the defeat of the Shan army (Mong Tai Army) of former « opium king » and warlord Khun Sa, gaining in the meantime a foothold along the Thai border. Now, the UWSA frequently clashes with the Shan State Army (SSA), constituted by remnants of Khun Sa’s military outfit, located along the Thai border and most likely, if unofficially, backed by Bangkok. As a matter of fact, the Shan « rebellion » has long been used as a proxy by Bangkok in its rather conflictual relationship with Yangon. Wa geohistory then meets Wa geopolitics when one considers that the former Shan States of Burma « served both as primary adversaries and first buffers against the shocks of the cosmic-scale events of the penetration of the Chinese state and civilization, as well as (if to a lesser extent) that of Burma », as stressed by Fiskesjo. Thus the Wa of the UWSA have been brought from a somehow obscure geohistory to complex geopolitics and are now in the midst of an increasingly controversial debate about the scope of their responsibility in the illicit drug trade. As far as geohistory is concerned, what we know for sure is that the Wa are part of the Mon-Khmer people, one of the indigenous and oldest peoples of Southeast Asia and also one of the world’s least-known. Historically, it is estimated that the central Wa territories made up 150 square kilometers in a very mountainous area between the Salween and Mekong rivers, where the UWSP/UWSA established Wa Special Region No 2 after signing its ceasefire with Yangon’s military junta. As emphasized by Fiskesjo, the Wa consider themselves autochthonous of northeastern Myanmar and southern Yunnan, something that can be argued for by the persistence, during the past few centuries, of an autonomous Wa center, both politically and economically independent. In the region, the Wa precedence is hardly contested: for instance, their Shan (Tai ethnolinguistic group) neighbors acknowledge that the Wa first inhabited the area, and, farther north, the Chinese of Yunnan also agree to be themselves later immigrants. Fiskesjo stresses that in southern Yunnan, « local Chinese still refer to the Wa as the benren, the ‘original’ or ‘autochthonous people' ». The Lahu, from the Tibeto-Burman stock, know of course they are the latecomers in the Wa territory, having moved there only in the 18th and 19th centuries. 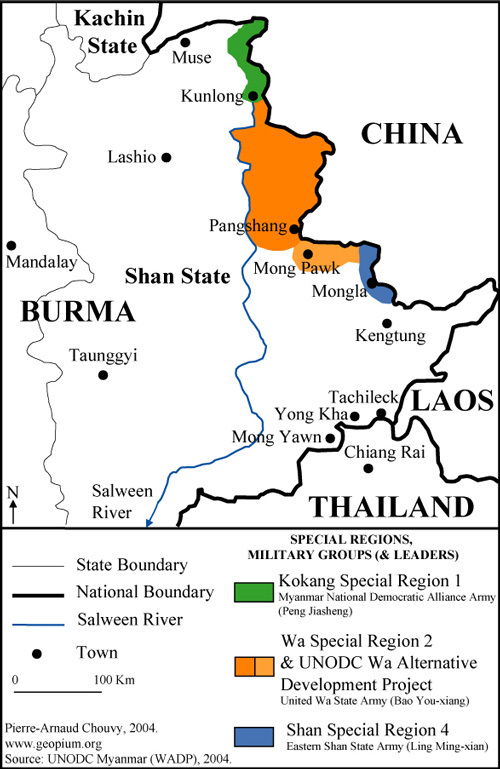 Also agreed by both the Wa and the Shan is that the former were expelled from their old lands by the latter, their displacement from former Kengtung State (in current Shan State) and relocation farther north around Mongkha being mentioned both in the Wa oral traditions and in the Shan chronicles. Mentions of the Wa being defeated and displaced by Shan immigrants are common all over the area, from the Kengtung area in Myanmar to the Menglian area in China. Common discourses on the Wa are still shaped by geohistorical perceptions and biases. As underlined by Fiskesjo, the surrounding « civilized » polities or ethnic groups saw the Wa as an external « barbarian » people, « wild », or even, in late imperial Chinese terms, « raw » (Wa who were not under Chinese administration as opposed to those who were, the « cooked » Wa). But, economically, the Wa are not very different from other highland ethnic tribes. Indeed, as is commonly the case with such populations in Southeast Asia, the Wa relied mainly on hill rice species grown under regimes of shifting slash-and-burn cultivation. Irrigated rice paddies were and still are scarce, even in those rare valleys where irrigation is possible. While Wa people in China have resorted to irrigation since the 1950s only, it is only during the past few years that they employed it within Myanmar. As for the main cash crop of the Wa, it has been, and still is to a large extent, opium, which became widespread in mainland Southeast Asia’s northern uplands by the late 19th century. As is still the case (only 0.8 percent of the population of the WSR2 were found addicted to opium in 2003), very little opium was consumed in the historical central Wa country, except for medical purposes. One has to acknowledge that Myanmar’s overall opium economy is clearly the outcome of a long-lasting political crisis and a protracted internal armed conflict, where the illicit economy is fueled by the war economy in the same time that it fuels it. However, opium production still appears to many as the only viable way to compensate for structural shortfalls in food security at the small-scale level of the peasant economy. Indeed, 75 percent of the population of WADP area suffers from rice shortages during four to six months of the year, a dire situation that UNODC wants to address by providing both alternative income (cash crops) and more intensive agricultural techniques, mostly through the double cropping of rice (better land use, irrigation, improved varieties of rice, etc). The Wa have launched a large-scale rubber-tree plantation around Pangshang, and China, whose border runs along the outskirts of the city and where most Myanmar heroin is trafficked, has promised the tax-free import of Wa rubber in an effort to help with opium suppression. The Wa of the UWSA would seem to have an unmatched opportunity in Myanmar. Indeed, the central government has granted them de facto autonomy that no other tribal group or political or military organization has ever gained in Myanmar. However, this huge opportunity that the Wa have in Myanmar, where a ruthless military dictatorship still clings to power and makes concessions only when it has no other choice, is to be used most cautiously by its leadership if it does not want to jeopardize its stability and very existence. Seemingly willing to change both its image and its status, the Wa leadership still claims that it is committed to getting rid of opium production by 2005, something that, if achieved at such a pace and in such material conditions, would prove extremely detrimental to its population. Although the UN and various non-governmental organizations are working in WSR2 to improve the people’s economic and health conditions, such a quick and drastic change – most likely aimed at proving their alleged sincerity to the outside world – could threaten both Wa socio-political stability and the status quo that the Wa enjoy with Yangon. UNODC, whose very presence in the area (working both in dictatorial Myanmar and with the so-called « world’s biggest drug-trafficking army ») is highly criticized by many democracy advocates, also tries to guide and advise the Wa leadership toward achieving what is a self-imposed goal. For example, UNODC tries to soften the humanitarian impact of the Wa authorities’ policy of forced relocation of opium-poppy growers from uplands to lowlands within the WADP area. Whether the UWSP/UWSA leadership will succeed or not in its goal to rid its territory of opium production, the determination of its senior leadership to achieve such a goal is evident. The Wa leadership declares itself fully committed to suppressing opium production and hopes to receive international help to sustain a move that could jeopardize the regional balance of power by threatening the fragile social, political, and military stability of the Wa Special Region. The risk is that, whether it succeeds or not, the UWSA will not get any help from an international community that imposes sanctions on Myanmar and views the UWSA mostly as a drug-trafficking organization. However, as stated in the recent report on Myanmar from the Transnational Institute, one has to remember that in such geopolitical issues, « demonizing one specific player in the field, as often occurs, usually has stronger roots in politics than in evidence ». And although Myanmar’s crisis is rooted in politics and will only be solved politically, the international community tends to forget about realities and issues at the local level as it is increasingly confronted with calls for stricter economic sanctions on Yangon as well as with the military junta’s struggle to cling to power. One has to acknowledge, when looking at the political and military deadlock that has characterized Myanmar’s recent history, that current sanctions, both political and economic, have not yielded the expected results. As more sanctions are imposed, it seems, fewer levers become available to the international community to influence Yangon’s policy. This is especially true when sanctions are imposed without being followed by neighboring states. For the main regional players, Thailand and China of course, but also India, there seems to be too much economic and geostrategic influence at stake in Myanmar to go ahead with sanctions advocated and implemented mainly by Western countries. In Myanmar, in the Shan State and in the Wa Special Region, one has to remember that, beyond highly respectable and important political and moral principles, millions of people struggle to survive on a daily basis. The main threat to the Wa people is a major humanitarian crisis after 2005 due to the opium ban enforced by the UWSA in spite of insufficient and inadequate developmental help. Considering such a tight deadline for such an effort, combined with international sanctions that will forbid the necessary aid from reaching either dictatorial Myanmar or the so-called « world’s biggest drug-trafficking army », the pace of opium suppression will not be matched by the ability to create alternative ways of living and rural communities risk being sacrificed. And since the ongoing opium suppression is clearly not sustainable without outside aid, it is the Wa people who will suffer the most from both the ban and the economic sanctions while opium production may only be displaced to elsewhere in Myanmar. Connexion | 56 queries. 0,359 seconds.